Michael Fassbender discusses David, Walter and Shaw in Alien: Covenant! Michael Fassbender just conducted a new interview with DigitalSpy and during the interview, Fassbender dropped some very cryptic clues concerning Elizabeth Shaw's (Noomi Rapace) fate in Alien: Covenant as well as discussed Walter and how Weyland-Yutani have made significant changes to the robot model since David 8. At the end of Prometheus, the only survivors were David (David's head in fact) and Elizabeth Shaw (Noomi Rapace). "As far as we know," says Fassbender. Check out DigitalSpy for the entire interview transcript. 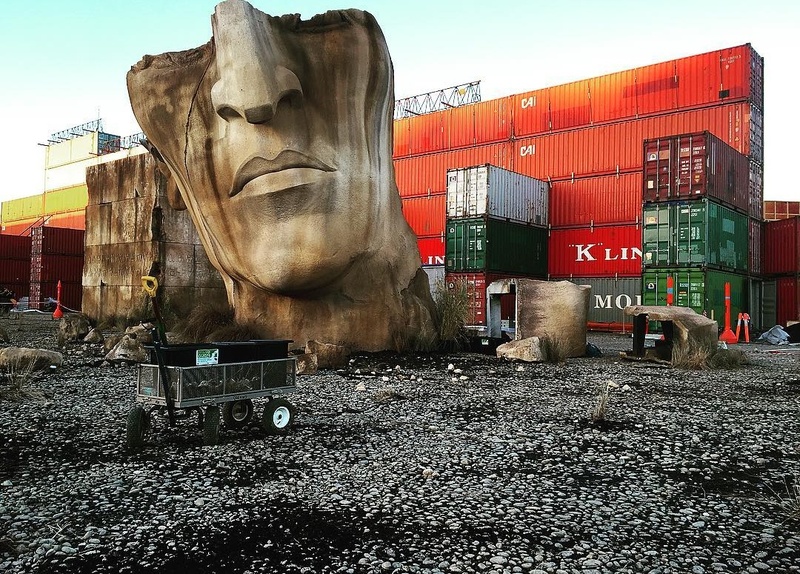 In related news, another Alien: Covenant set photo was discovered on Instagram (via AvPGalaxy) from 4 weeks ago, which offers another look at the Engineer temple ruin set which we reported on earlier this year. 45 Fan responses to Michael Fassbender discusses David, Walter and Shaw in Alien: Covenant! I do not believe that the dog tags seen in the trailer are Shaw's as she was only seen to be wearing the cross around her neck. Also it stands to reason that Shaw is unable to use the sleep chambers as she is not an "Engineer". I was under the impression that the dog tags were that of Holloways? That Shaw kept. Perhaps Shaw didn't survive the flight or the crash and David made use of her body but that's begs the question as to how David got his head reattached. So maybe David offs Shaw before they even get to "Paradise", and they scenes Noomi shot were to be a flashback showing how that occurred? Maybe? "As far as we know"...who could survived there more? What about that lady, Wayland helper, I dont remember her name? She didnt get so strong hit from Ingeneer. Maybe she? Or Wayland's mind? I think Ridle Said there is not gonna be deacon in AC? how certain are you? I can't think of anyone else that'd have made it onto the ship. The deacon would explain the crash and the egg that is already on the planet before the crew even arrives for David to experiment on. Any thoughts? I think we have to speculate from the facts we saw already. 1.The ship crashes. Something happened during the trip...david is the only one capable of flying the ship. So shaw had to fix david,she cant fly the ship.. regarding what happens..either we see david doing something to her..or the deacon did. 2.the planet they crash is paradise but not the engineers world. First scene of prometheus shows elders delivering goo to the cloak engineer ritual to create life.the planet in covenant its the same one.the black goo already took its course and changed the planet.the chemical goo has different applications being one a weapon we saw in prometheus military base of the engineers. 3.paradise had engineers community's but they all dead.if that has anything to do with the ship crashing or previous event outbreak..we will see for sure. 4. Many of you almost take for granted the plot of the trailer most was revealed but not even close..was just a crumb. I doubt david will be the bad guy.weyland yutani fusion made walter obedient and with no soul. We see walter letting the cap.getting facehugged.fact. they want the specimens. David gained or awakened a soul i believe and we will see his redemption on covenant,he will do more good then harm..
5.eggs. we know we have a protomorph wich is big as hell..those hands in the glass of the shower are bigger then a regular xeno. We know the cap.is the vessel. We have neomorphs and we gonna have the adult version.in those leaked images some of you said were david lab..its just props used. The big white head is the adult neomorph prop. Question is...how did the eggs end up in the cave..neomorph..deacon...or something else..unless david made with shaw something very crazy..but i dont think david would harm shaw..we wont have a queen either..we do have eggs in the ship on alien1..so we will discover how eggs came to be,and who made them. We saw crew being infected...we saw paradise...we saw david and walter..we saw the proto...we saw baby neomorphs..very small things comparison with what we will see in covenant as a whole. The only thing that confused me was the moment david.or walter if past or present. Scene in the white room with weyland..either a young weyland or a david walter scene..but there was a piano..that to me seems like a base shelter on earth..looking at a panoramic digital view of paradise..so to me that would mean weyland knew anout paradise...or it was shown to walter and who is in charge of weyland yutani..that paradise is ready to be terraformed pretty much a early scene of the movie..and so david in this case would be really the bad guy. I'm thinking something happens to Shaw during the flight to paradise and she is killed by David. He makes it to the homeworld, flies and holds above that Engineer citadel. The engineers maybe are baffled by one of their own ships being there and then David drops the death payload and wipes them out. He then takes residence there and starts his experiments. If there are zenomorhps or protomorphs on the planet why don't they attack David? Do they sense he is not a organic person? It seems like to me they would attack anything. They did it to Bishop. Hmm? David creates that protomorph, well, the egg and then lures the Captain (Billy Crudup) into the cave. There is only one, "The Big chap" as Scott calls him. David uses the Covenant crew as experiments once he gets them back to his lab under the citadel. By the end of the film, I'm betting Walter becomes the new villain. It isn't rumored that's David tries and can communicate with the Neomorphs or so said someone that saw the early screenings. Yeah, she will have some screen time but possibly through flash backs and also David leaving her in cyro-sleep, perhaps messing it with so she die and then use her body. So maybe it goes like this. Alien Covenant starts during the time before the ship (David and Shaw leaving to Paradise). The scene shows Shaw somehow reattaching David's head. Once head is attached the two launch for Paradise only they are not 2 but rather 3 as the Deacon has stowed away on the ship. At some point the Deacon attacks Shaw, unbeknownSt to David and begins the process of transforming Shaw into an egg ( I think Ridley really wants to drive home the concept that the eggs are created from transformed victims like Dallas in the deleted scene from the original Alien). At a little later point Deacon attacks David, ship crash lands in Paradise, the Deacon dies but David and the egg survive. The dog tags Daniels finds in the trailer were held by Shaw but belonged to Charelieve, her boyfriend. David becomes sentient during his stay on Paradise, developing new genetic infractions based on the Engineers library of work. Either he makes the neomorph, or he finds a docile species that he turns into them/they're already there. That first part is one of three major twists. He discovers that the engineers are biomechanical beings who were nothing more than servants of supreme elder gods who, in a double cross retcon, are the gigantic things found in Alien/the jockey. This is why they pitied David during the Prometheus wakeup scene. Them beating the humans with his head was akin to their own gods resenting the engineers for humanity. Same idea of successors. A: Fuse into metal or are actually formless, and can use basically space alchemy to possess metal and reform their molecules e.g star trek beaming. B: The above but phase through it, walking through walls or vents, for example. In short? Engineers are biomechanoids, not perfect mammal gods. David is sentient, and the "God" of Weyland robots. David creates the xenomorphs to make a perfect being in our universe. This is why the Alien (original film) robot reveres them so, they know in their coding that David -- an android -- made them. It is also why Wey-Yutani wants them back in every single movie. They wanna know how he did it. Very interesting comment.... but its very ambiguous and misleading.... before i tackle each of the replies.. i will give my TWO CENTS then read the other comments on here. 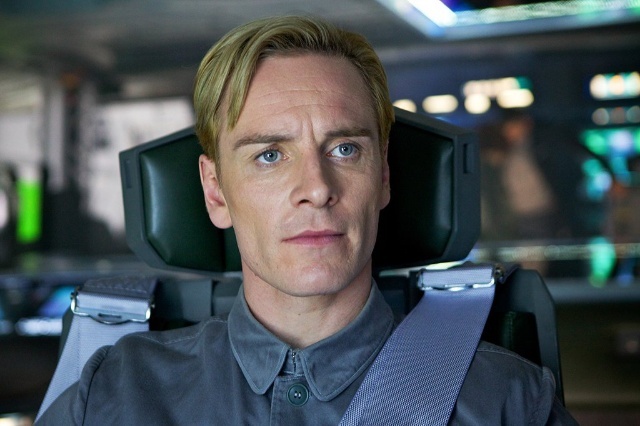 Is to me aimed at the Viewers... Fassbender would know for sure, and so he means as far as We the viewers and maybe David and Shaw did from Prometheus. Here is a run-down of the possible outcomes. 1) Engineer.... a Engineer or Engineers could be possible, we see that in Prometheus only One Survived in Cryo-sleep the other 3 in that Ship Bite the Biscuit... (Chest Busted)... They have taken another ship and we cant rule out other ships having Engineers too. c) ask David to wake them up and get her Questions answered. 2) Deacon.... could the Deacon had got on-board? The timescale of the movie showed and artwork that the Deacon had happened after David and Shaw had left.. so NOPE the Deacon is not on board. 3) Milburn.... or any survivors.. I would say Milburn is dead... maybe he is Gestating something laid by the Hammerpedes but how would they follow David and Shaw on that ATV or get on the Buggy? Same goes for any survivors.. there is NO-Way any other Humans or anything related to Milburn gets on board. 4) Cargo.... straight up we know the ship has Cargo, Ridley even said it would be carrying Hell with it.. in regards to the Black Goo.... so technically yes the Black Goo is something on-board.... but the "As far as we know" comment applies to the viewers and maybe Shaw... and as far as we know.. we do know it has a Cargo and Shaw does and i doubt she would want to choose a ship that has none.. or get David to unload the Cargo... The Cargo is also a insurance a Bargaining/Deterrent chip if the Engineers are not so friendly.. But as far as we know... we are assuming and maybe Shaw too that the Ship has Black Goo Urns... it could actually have something else. Maybe Eggs? who knows.. Make the whole how did David get Eggs Question more easy and then leave the Xeno Mystery in-tact.. Do we know the other ships all have the same Cargo? Or if anything has evolved in one of the bays? But Nope.... i think the Ship has Black-Goo. 5) Hammerpedes.... well Worms.. they have taken another ship and we dont know if its from the same Temple in another Hanger or another Hanger in another Temple. Worms are tiny and they could easily get on the ATV, into Shaws Back Pack... and even if not... they are somewhat indigenous to LV-223 or at least have been on that World prior to the Prometheus.. and so there is a chance a Worm or other small native Organism could creep on-board. If there is anything to Fassbenders Comment and AC wishes to somehow connect Prometheus 2 and LV-223 and Black Goo to the Xenomorph... the Worms could be used as a Plot Device. When i look at LV-223 and the Space Jockey and Chest Busted Cryo-Engineers and how the Hammerpedes were under-used.. and looking at the Life-Cycle of Worms..
2093 Worms + Goo = Hammerpedes. 2000 years prior Outbreak... and who is to say the Goo 2000 years ago.. or 2000 years time + Worms = Hammerpedes again..
Its logical and what the Source somehow implied. "Do they sense he is not a organic person? " Spaights draft shows us the Face Huger has no interest in David, it would be the same as a House Fly having no interest in your Chocolate or Candy Canes... David is not a avenue for the Procreation of the Xeno. But as far as Adult form..... well Alien Isolation showed the Xeno ignored Synthetics and i think this is likely to be shown here as Canon.... however if a Xeno feels a Synthetic is a threat or poses a obstacle like Bishop in Aliens then i think they would have no hesitation but to de-activate David. Its a bit too Jurassic World for my liking.... i dont like the idea, i would assume the Neomorphs or what ever are very primordial and instinctive and David would have as much luck trying to control a Wild Lion or Shark..... i hope they dont explore the David can communicate route... and i hope the Neomorphs are more animalistic and well they too me would be less Evolved on a Social Level than Fifield was. I dont recall the Prometheus crew having Dog Tags..... certainly Shaw did not... but they could add it in that she did. So maybe the Dog tag is Captain Crudrups.... he goes missing, David may mislead them to suggest he has not seen him and then when they go exploring... Daniels discovers his Dog Tag... or at least some other member of the ships Crew. As far as the Deacon goes... i would highly doubt it would have got in the ship.... the end of the movie suggests the Deacon had not left the crashed Prometheus Lifeboat before David and Shaw was gone. i also dont think we would see David headless... or put back together..... it would be extra time added onto the movie for a Plot Device we know has been done (David getting his head on). It was deemed not necessary as far as the Plot... The outcome we was showed they had taken off in ANOTHER ship which David said there was.. and so we know this was the case. If David did not need to be put back together... then Shaw would never put him back together because she could turn up to the Engineers Homeworld with Davids head as a Translation Device. But indeed i am sure David will have Shaw at his Mercy. I can fully agree with most of what you have said, i can try discus but it could be a big lot of posts to some very good points you have put. "The big white head is the adult neomorph prop." Your comment about the Davids Lab is just Prop room is most likely correct... the set could be a Davids Lab and those his experiments to a degree... but it wont be exactly the same as that photo... and a number of these designs may not even make it... Prometheus has un-used props and concepts too. The image was taken down because in part i think its likely some things in that Creature Creation Concept Room will appear in the movie.... and i dont mean the obvious stuff Ridley had already said we would see.. (Egg, Face Hugger and Big Chap). As far as that Head... maybe yes.. it seems to have that Neo-morph look and its like the one in the trailer a bit (if you study the trailer scene close) But it looks a bit of the Failed Alien R Clones.. and to me looks like a Fifield Mutation if for example there was more contact with the Black Goo... or Black Goo infected a Unborn Early Stage Child Fetus say 2-4 weeks. "The only thing that confused me was the moment david.or walter if past or present"
In the related Topic i detailed that this scene must be from the year 2025-2042 and be David 1, 2 or 3. As far as the Paradise... indeed looks the same, but then there has been a topic about that... well pointed out in topics... and well The Sacrificial Scene was shot on Earth, was intended to be Earth but Ridley said it could be any place because the Engineers seed life all over the Galaxy. so it could be Paradise... the scene is not the same as Prometheus... i dont think so? Well it could be... the same location as in Prometheus but thats not to say its same as Covenant..
*There is a Painting of the Nativity... which is the Birth of Christ... a child who grows to become God, can perform things that a Human could never..... a Enchanted boy. I think those theories are good and close to the ball park for sure.. The Xeno-DNA and Synthetic connection again its something i wandered about right from before Prometheus... its logical but a bit to on the nose... and go against the whole Ancient Space Jockey.... which does not have to be Ancient.. but i feel the Chest Busted 2000 years old Engineers in the Cryo-Pods are not Coincidence. So i think like this... with different tail a bit and head... but i think the way it uses its Tail and the Legs are being re-done.. well Evolved due to having the Technology to pull it off. Better Puppets, with CGI overlay and Costumes with Mechanics to give this Aesthetics to make our Xenos be able to function like a Rat can in tight spaces. Have to find my P2 draft out.... work in progress i aborted in 2014.. I dont think it was ever intended to be explored.. Here was my line of thinking..
2) It would however have rapid Procreation Cycle... so no 9 month Gestation of a Child.... but Hours..
3) It could be Asexual... but then we need to fit it with Alien and make it Horrific... Worms can reproduce Asexually they are Hermaphrodites but it needs TWO Worms to Fertilize each others Eggs (why i think the Hammerpedes should have been expanded on and i think they lead to the Chest Busted Engineers). so Hammerpedes need TWO to Mate.... i thought the Deacon needed a Host... it may birth its own Child... but a Host is needed to fit with Alien.... and so basically the Deacon is like Sil/Eve from Species.. Alternative Deacon and Alternative AR Newborn. *The Statues are knocked over and Head Statue Damaged, the Goo cant do that.... (then these things could happened as a result of War/Uprising) or earlier disasters. I am calling this a Flash Back Scene.. that may even predate David's arrival. @BigDave Deacon can be easily on board. Thanks to editing, we could be tricked that David and Elisabeth left BEFORE the Deacon was born, but in fact, it happened AFTER that. The Hammerpedes however were never explored much,.... why did it go into Milburns Mouth? could it have laid a Egg inside? I would not be surprised if the Hammerpedes are followed up on. Hopefully some Fiction.. i.e Novel or Comic would show us what could become of the Deacon.. I think Shaw ,after finding out the planet was not the home planet of the engineers went on searching with another ship, driven by her strong eager to find mankinds origin. David says he will follow when the search crew arrives looking for their beacon, but actually he has other plans. Shaw reapears with more presence in the next film. Thanks for theclarification Dave. I appreciate it. Some of his pints I read made some sense but I know it most likely is not true. Thinking on David, I do believe David will be central to what happened to that planet and that he is solely responsible for their demise and the creation of the iconic Alien based on his play with his experiment and most likely will bloom when he has the Covenant crew at his house of horror. I suspect David will use the crew to expand his creation. However, I do believe Walter will play some important part as the updates to all androids have taken place and now are an agent of the company to get things done. Perhaps Walter could be the first "Ash"with a mission known to the crew but we shall see. I'm sure as the months roll by, we will see more of the plot in the viral campaign and the in the new trailer which will give a little more of the plot. Thanks for putting it all into perspective for me. You guys make this a great site to visit. Keep it up! As far as we know...Ooo Fassbender is totally messing with us. That really could mean anything. I'm thinking it's either a person or creature. Maybe an engineer, but more likely one of the creatures from Prometheus. Imagine if it was Vickers lol. That would be a total wtf surprise. Charlize Theron is a great actress and it would be super shocking if she showed up somehow. It always bothered me that she didn't run to side or at least try to roll out of the way. Just kidding about vickers. It's more likely a hammerpede that attacks Shaw on the ship which leads to the crash. David definitely screws her over. I'm almost positive about that. why did it go into Milburns Mouth? could it have laid a Egg inside? The returning crew find Milburn's very dead body with the Hammerpede still inside. It jumps out his mouth and scares the bejeezuz out of Ford. So Milburn's is surely dead, and certainly not gestating a traditional xeno or Deacon. Seems like a dead end plot wise. I dont want to bring this up as a cliche... but the Source (again if true) i had from February 2015 had said indeed Paradise is not the Homeworld of the Engineers or at least the Hierarchy above them... it was just the Headquarters if you like in our Galaxy and the Hierarchy is more vast than merely our Galaxy. This holds some weight as the Star Map in the Orrey scene in Prometheus we see outside of the Sphere of Worlds and co-ordinates that David was looking at.... we see on the outskirts many Galaxies.. So these Engineers can travel beyond our Galaxy. Indeed i feel Fassbender is interesting, Rappace Character was not so much but there is grounds to improve.. its a cop out to get rid of them both and Engineers and give us Ripley and Aliens... if the 4Chan leak is correct.... a major cop out.. I am thinking it must hint most likely to something gets on board or the Cargo is not Black Goo well was but not now..
And indeed, i think the Hammepedes are the most likely stow-aways and also most likely suspect to the LV-223 Chest Busted Engineer in Cryo Sleep. Hammepedes evolved from Worms... if these are like common Earth Worms.. they are based off Organisms that are Hermaphrodites they are Male/Female they have Eggs/Sperm but cant reproduce on their own... it would take TWO Worms to mate and they both would then have Fertilized Eggs. I think there is every potential that the Hammerpede could have laid something inside Milburn.. for sure..
zaYeah that was always my assumption. Milburn was a food source for the young pedes, as were the sleeping Engineers. Anyway a bit off topic here. If there is a third passenger on the Juggernaut I would like it if it was the Deacon, however unlikely, and we got some more information on its connection to the classical xeno. If Shaw and David crash - and it does look like they crashed - on a planet other than the Engineer homeworld then it stands to reason that they were brought down by something. More likely though is that David never intended or even knew about where the Engineers came from and was playing Shaw all along. Yes , the engineers may also come from outside our galaxy, but what i meant was that since they were not on "paradise" she went on searching, and that is why she allegidly has a small role in this film and why i think they will pick up more of her journey later. Aside from the alien aspect , the red line through prometheus was Shaw and her search for mankinds origin, and i doubt that part of the story just ends with her dying early in this film. Besides ,as already has been mentioned, she had a crusifix around her neck and never wore dog-tags because she was a scientist and not a military asset on the mission. Hah, I just realized David must be named in honor of David Giler because Walter must be named in honor of Walter Hill. Sorry if this is old news :).